These are the top 10 kitchen tools you will be using on a regular basis. 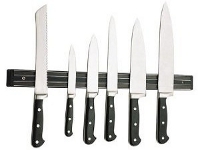 They help you become more efficient in the kitchen and make your overall cooking experience a joy. It is a no brainer that this comes first in the list of top ten kitchen tools. You cannot imagine cooking without them. 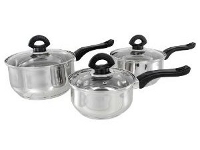 Sets of pots of different sizes are what you would want to invest in when equipping your kitchen. 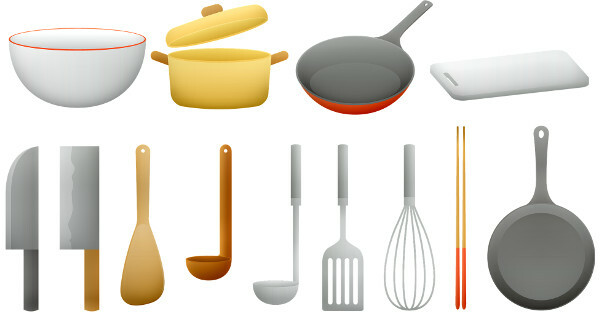 The different sizes will enable you cook small quantity food as well as cook for a large party. It also makes it possible to use the right size of pot for the different sizes of burners. Most of the cutting tasks in the kitchen are done with a knife. In spite of the belief that a sharp knife is a hazard in the kitchen, it is still better than trying to do the job with a dull / blunt knife. A sharp knife will ensure that you cut those leafy vegetables as tiny as you want them. When buying, hold the knife to ensure that it sits comfortably in your hand. 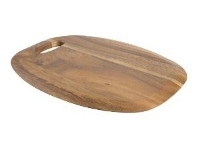 How can anybody not have a chopping board in their kitchen? A good sized chopping board goes hand in hand with a sharp knife in getting the cutting jobs done. Keep the knife marks off your kitchen counter and your palms by using a chopping board. We all know that timing is a very important aspect of cooking. Some people even have a programmable timer so they can get the cooking times perfectly right. It is a good habit to time each stage of your cooking and subsequently the total time it takes to cook a particular recipe. 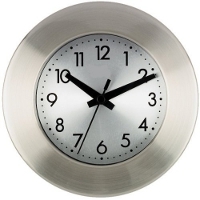 And there is no better tool with which to do that than a simple kitchen clock. 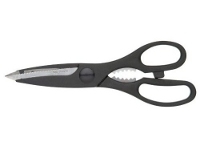 If you do not have a scissors in your kitchen, please buy one today. No other tool beats the kitchen scissors in such tasks as cutting spice packets, cutting tiny leafy vegetables (e.g. curry leaf), cutting open small packets of rice, spaghetti and noodle packs, sachet tomato puree etc. What could we have done without these simple tools? Keep opening cans with knives? Oh no! 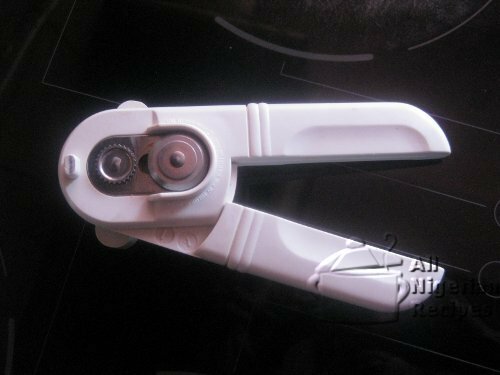 These days there are many models of can openers and the best are the ones that open the can from the side rather than from the top. This covers all types of towels in the kitchen; paper towels, sink towels, cloth hand towels. The kitchen is one place where you wash your hands so often and after doing this, you must have the need to reach for a hand towel. If not, water will drip all over your kitchen, making a mess. It is also good practice to clean as you cook and this is where the sink towel comes in handy. 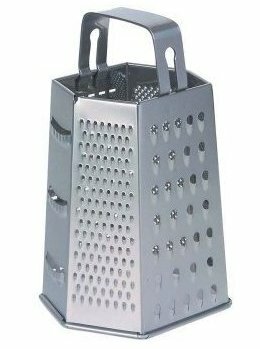 Graters are very simple tools yet very useful in the kitchen. Use large holes on it to grate your carrots when you want to make the Nigerian Salad. Use the tiny holes to grate your orange peels when you need just the flavour from them. This kitchen tool is a must for grating nutmegs, ginger and garlic. Sieves are necessary for a wide range of tasks in the kitchen. It is absolutely necessary when parboiling rice, removing beans coat before cooking the Nigerian Moi Moi, washing bitter leaves, to name a few. 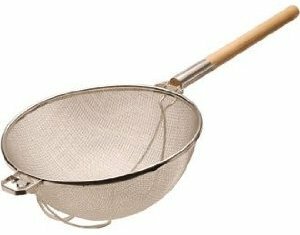 The fine sieve is very useful when extracting coconut milk or juice from your grated orange peels. After scraping your carrots, you can pour the water into a sieve instead of directly into the sink. It prevents even the tiniest pieces of the carrot peels from clogging your sink. Assorted bowls keep you more organised in the kitchen especially when you are preparing a recipe with lots of chopped vegetables. These include: Nigerian Salad, Vegetable Sauce or the Nigerian Fried Rice. You can easily place the vegetables in separate bowls right after cutting them. 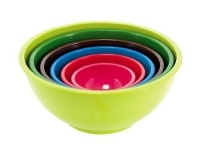 Plastic bowls with cover are also very useful in storing food in the fridge or freezer. The much bigger mixing bowls are very useful when washing vegetables and during the mixing of Moi Moi recipes.